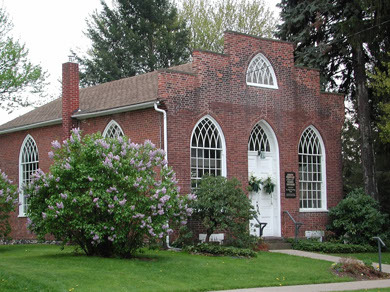 I had the pleasure of reading at the Priestly Chapel here in town again this Sunday. This is the second time they have kindly invited me to be the featured poet for their Second Sunday Service of Music and the Spoken Word. The musical portion of the program featured The Bloomsburg Early Music Consortium, and it was lovely–recorders, a lute and an ancestor to the viola whose name I cannot recall. It’s such a lovely venue too and the acoustics in that little chapel are marvelous. Each month, aside from the guest poet and musicians, the service focuses on the work of a great poet. For some time now they have been featuring poet laureates, and this Sunday it was William Carlos Williams who had been appointed as Consultant in Poetry in 1952. Unfortunately for health reasons, Williams never actually served in the position. George Manning, who read the Williams pieces has a strong voice with sonorous tones are always a pleasure to hear. I almost think he could read my tax form and make it sound gorgeous. Williams’ poems have served high school English teachers worldwide with debate material. You yourself may have sat in a classroom where you were read “The Red Wheelbarrow,” and then pressed to answer the question, “Well class, is it a poem or not?” And rather than get into a lengthy discussion of why it is, and why the person asking should stop being a pretentious twit, I leave you in the hands of Carol Rumens at the Guardian who explains a few things rather nicely. While I recently disagreed with her about the importance of “One Today,” Richard Blanco’s inaugural poem, I find myself in agreement with her grasp of the wheelbarrow handles. we shouldn’t forget that poems are made of line-breaks as well as words, and “so much depends”, in this poem, on the splitting of the two compound words, “wheelbarrow” and “rainwater”. These dissections slow us down, and help the mind’s eye to register more: the individual wheels as well as the body of the barrow, the water that is more than raindrops. Important for their spatial emphases are the prepositions. “Upon” and “beside” are two little words that the poem magnifies hugely. Their implications float beyond the phrases that contain them. Read the rest of her article from March of 2010 by clicking here. In his discussion of Williams’ methods and philosophy of writing, Craig Morgan Teicher offers some great insight into this little gem that Rumens called a modern poetry “manifesto” in this learning guide article from the Poetry Foundation. Williams had an unusual life for a major literary figure. He was college buddies with Modernism’s high priest, Ezra Pound, at the University of Pennsylvania. But rather than spend his nights cavorting in Europe’s literary salons, he chose to become a doctor and live most of his life at 9 Ridge Road in Rutherford, New Jersey, an address that became a pilgrimage destination for younger poets. . . This is not to say he didn’t live a literary life—he and Flossie frequently traveled to New York and hung out with poets and painters. He was a friend of Marianne Moore’s and felt himself engaged in a lifelong rivalry with T.S. Eliot, whom he thought had turned poetry back toward high diction and the literary past, while Williams, like Frost, believed that “modernizing” American poetry meant incorporating contemporary, American speech into its fabric. This is not to say that he was concerned only with things, and with ideas not at all, but rather that he felt that the real way to get at ideas was through things. This is, after all, what metaphor is about, is it not? To paraphrase poet Billy Collins, as he said once before a reading of “The Lanyard,” his piece about making a gift for his mother at camp, the way to get to the big ideas is through a small door, something ordinary that can be used as a vehicle to get the reader from the particulars to the universal. Of course, he wasn’t alone in this. Other modern artists were taking this route too, and it’s not like this route hasn’t been followed before. It’s not too dissimilar from the road originally paved by that old Greek philosopher Aristotle. Unlike his teacher Plato who imagined a realm of perfect forms of which the things of this world are mere imitations, Aristotle asserted that the only way to get to the ideal forms (or for our purpose here, I’ll call them ideas) is through the tangible, corporeal things of this world. You won’t necessarily read Williams asking big lofty questions like “Dare I disturb the universe?” But you will see him dancing alone in his room fighting with the great themes of loneliness and happiness in “Danse Russe.” It’s just that he doesn’t like to play the pedagogue, handing down to us from a lofty lectern our lesson for the day. He prefers to take us there through familiar images and recognizable words, and allow us to find our own way there. This makes poetry a journey rather than a lesson to be learned, or a moral to be taught. To be fair though, even Elliot brought the questions down to the realm of the material, “Do I dare eat a peach?” he asks in “Love Song of J. Alfred Prufrock, the same poem quoted above. But it seems to me that critics of “accessibility” in poetry often fail to see that we represent ideas and ideals better when we can get at them through what is familiar. And personally, I have little patience for poems that are written for sake of difficulty itself. It’s not that I cannot enjoy a meaty, chewy piece of art, it’s just that I have been turned off by many a poet who speaks more from the intellect than from the soul. Humanity, and thus the humanities, involve the entire person, the physical, the mental, and the spiritual, or emotional if you prefer. And then there was my reading of Kenneth Koch’s parody, “Variations on a Theme by William Carlos Williams,” a poem that honors the original whilst poking a bit of fun at it. And I’ll leave you with the final of the three Williams-ish poems I read, but I’ll let you read it for yourself. This poem honors Williams and the plums, and answers critics quite nicely I think. It’s by William Stafford. Next Post Another Poem You Wish You Had Written, from Suzie G.
I have often wondered if most of what I write could be called poetry; you have reassured me a little. No, it was really interesting. I always enjoy your readings…and your posts. I love your poems, and your vocal readings too, sir. It’s always an honor to receive a comment from you. Thank you! Interesting things should take their time, and this was interesting. Two of my favourite “modern” American poets are ee cummings and Williams. Thank you. I appreciate that. Tonight my friend Rick read this poem by E. E. Cummings. I got teary eyed, It’s one of my favorites. Thanks for the lovely poems. k.
You are very welcome. I am tickled that you enjoyed them, because they are so very much more important than the commentary. This is marvelous. I love visiting David’s blog. . . I always learn something and feel enriched. Loved this post, so much fun watching Williams plum poem being acted out–“so sweet, and cold”! Reminds me of the drawing of the 6 persimmons by the zen monk. It’s not so much the simplicity of the drawings or the poem, as how those images connect with the reader at a very visceral, elemental level–capturing the essense of the thing, perhaps. He does do wonderfully with that poem, doesn’t he? He has a few more online like that. I love this way of delivering poetry. Thanks for being here to enjoy it! Wonderful essay on one of my favorite poets and your own experience with his subject matter. Small doors open to some big ideas. Thank you, good sir. I am extremely pleased that it pleased you. Wms also reached forward–because he was available in the general area, he also met and helped Ginsberg and crew. When I taught The Red Wheelbarrow, I didn’t ask if it was a poem. I asked, “_What_ depends on the wheelbarrow?” Interesting conversations on the future of American farms. So his helping the beats was, and being a personal influence on Kerouac and the gang is an extra benefit of his choice to stay in the area rather than go off to Europe, like his buddy Pound or his rival Elliot? Good points. Pound and Eliot had their influences as well, but they chose their culture, and it wasn’t American. I think Virginia Woolf’s writing owes something to these two poets (I was thinking of her anyway, because of the Browning post–she wrote a biography of EBB’s dog, Flush. Good book). I think one of the primary benefits to Wms’s choice to stay put is that he kept his life grounded in real people’s lives. He saw the red wheelbarrow in a poor black man’s yard as he was making his rounds. His poetry is approachable because we have experience with his images–my students find Eliot offputting because they don’t watch Wagner in German or read Dante in Italian. Danse Russe, on the other hand, makes them stop to think about what he’s saying, but they can see the image clearly in their minds. There’s one of his about a piece of broken green glass behind a hospital that I can’t remember the title of–I’m still trying to put a meaning to it, but I can accept the beauty of it without Understanding Its Significance. Me too–wordpress and facebook are my only connections to the life I knew before December 6, 2012. I was going to ask! Add me on facebook if you are safe to do so. David J. Bauman. Friend request sent. Oddly enough, we don’t have mutual fb friends… hm. I have declared facebook a safe zone in my own life–I follow a few pages that fill my news feed with gay-themed pictures, and they have been a source of comfort here in Saudi. I use my middle name, so people in my real life can only find me there if I tell them how. Funny, in my “Writing About Writing” class (Eng 355) the other day, we discussed how to determine what is poetry and we read “This is Just to Say” by William Carlos Williams. Your blog just put it all together! I wasn’t sure how deep to get into it, but these are all issues that are important to me as a poet. I’m glad it carried enough scholarly weight to help make things clear and supplement your studies in class. One of the best compliments you could give me. Thank you! I’m glad that was a compliment to you! I actually have a quote for you! YES! I hadn’t read that before, but J.D. captures my greatest complaint about what often passes for poetry. Difficulty and artifice might make clever verse, but that doesn’t make it good poetry. There’s enough soulless philosophy out there. Do we have to put into rhymes or lines? Right? Too many wanna be Shakespeares and Dickinsons out there. Well, I was enjoying the road rage poem, and thinking about it on the way to work. I have a bunch of driving poems, and have been thinking about a comic road rage one. I had to run off to work, and just got home, but I’ll get back and comment when I can! 🙂 You’re doing great, I am sure.